This past weekend we did something old and something new*; a Sunday hike at Bull Run Mountain, which we’ve visited many times before, and a Saturday hike along Cub Run, near Chantilly VA.
Cub Run is a tributary of Bull Run, and starts from just south of Dulles Airport and meanders south about 10 miles to where it flows into Bull Run southwest of Centreville, VA. There’s quite a network of trails along Cub Run, but I had not hiked any of them, so for the first outing I chose to take advantage of the Cub Run RECenter as a jumping-off point for a roughly 5-mile hike north and south of the center. A map recon was good enough to announce the hike, but since I hadn’t visited before, I hiked the route by myself at dawn a couple of days before the group event. What a rewarding visit! Click on the photo below to view a Flickr slideshow in a new window. Dawn is always when all the animals are out and on their best behavior, so to speak, and if you’re by yourself, it’s much easier to go unnoticed. Quite a few deer were out, including a cautious doe and her unconcerned fawn, and a heron flew over just as I was finishing up, with its characteristic crooked-neck flight posture. (Surely that’s uncomfortable!) The actual hike on Saturday was pleasant, but since it was much later at 10 am and with lots of folks, it was a much different experience. 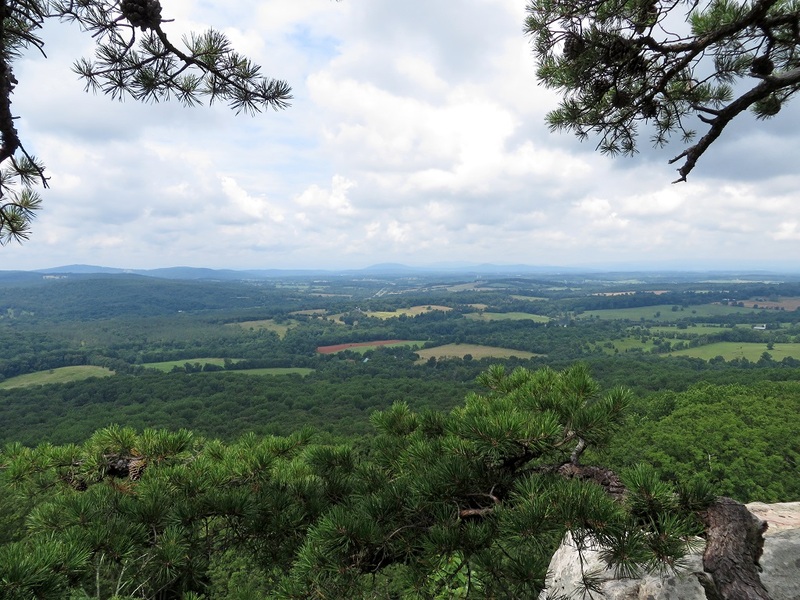 Anyway, Bull Run Mountain has one of the best payoff to sweat ratios around, since a relatively easy 2.5-mile climb yields a rewarding view west from the rocky cliffs, with the Appalachian Mountains in the distance. While enjoying the view, we glanced down and noticed someone else enjoying the midday sun on the cliffs: a big timber rattlesnake! It was obviously aware of our presence but unconcerned, since it was still sunning itself when we left. In addition to the changed usage guidelines at the conservancy, there’s another notable charge in the area: the Haymarket Village Center has been completed at the nearby intersection of I-66 and US-15. Purists might lament any construction whatsoever in the area, but I suppose the residents of Haymarket are just as entitled to groceries as everyone else, and it doesn’t really take up that much space. A fringe benefit is that there are now a few nearby places you can make a pit stop before and after hiking, if you aren’t overly fond of portable toilets, as well as a few more restaurants for lunch. * No, no; not any of this kind of old and new stuff. Hiking, not getting hitched. 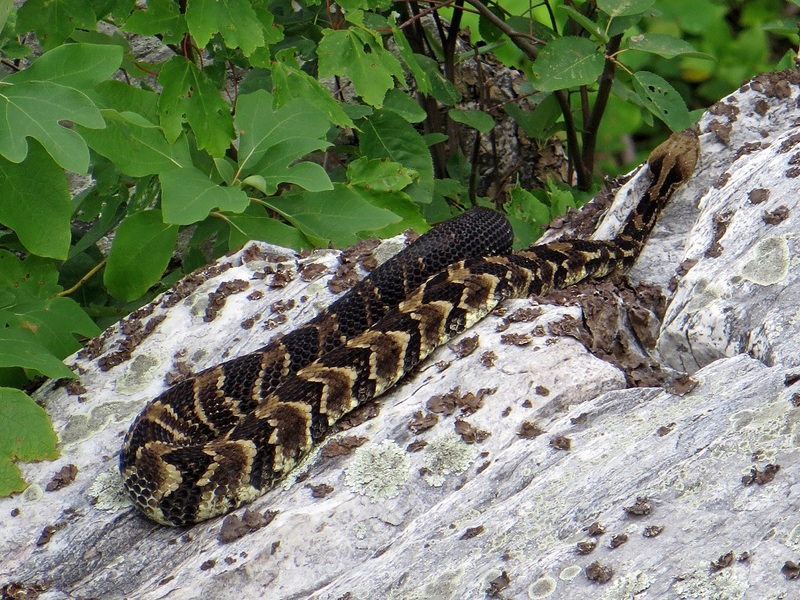 This entry was posted in Hiking, Photography and tagged Bull Run, Bull Run Mountain, Cub Run, Dulles Airport, heron, nature, outdoors, Shenandoah Mountains, timber rattlesnake, wildlife. Bookmark the permalink. Eeekk… I suppose the snake won’t badge at all. He was there first. 😛 Thank you for adding the link to Flickr. Beautiful photos of the fawn. Too funny, about “this kind”. I suppose this is a joke with your hiking group. Besides my son collecting and studying and releasing rattle snakes for his grad studies, we came across one as we hiked recently. It was interesting to watch him manage the snake. Yep, the snake had a fair claim!